Apparently, the quickest way to fame these days is to put nasty stuff on your face/head. The girl shown above is Japanese celebrity Shokotan, who enjoys accessorizing with the dried and discarded shells of cicadas. Ew. Read more at Pink Tentacle. Pictures via the Shokotan blog. As for the upcoming contest, thanks for the support! I'll be announcing the details tomorrow, so stay tuned! Whoa... O-o That is gross! *Sigh* Is that really the only way to get famous? Two trends: she looks like she's go the anime contact lenses. And I need slug hair clippies and a tarantula hair band. I can just hear my sisters: "You're not really going to youth group in that, are you? You are? Is this a bizarre joke?" SWEET!!! Sorry, but that is so cool! I'm hoping that when girls do stuff like this, that other girls will realize that stuff like bugs and slugs are cool. I can't wait to find out the contest. Patsee and Hazel: That is exactly what I was thinking!!! she's DEFINATELY wearing the contact lenses. This sort of reminds me of the celebrity trend of Giant Madagascar Hissing Cockroach Brooches. If you've watched America's Next top model you probably know what im talking about. These cockroaches are encrusted with Austrian Swarovski crystals and cost roughly $80.00. I wouldnt let one of those "deisigner accessories" crawl over me! xD Great minds think alike. 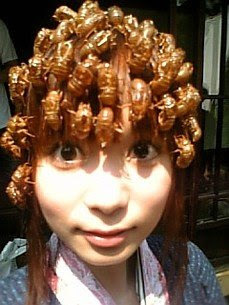 I am totally wearing some cicadas to school on Tuesday. That is so scary! Creepy crawlies are my worst fears. That girl is pretty anyway.She didn't need those gross stuff on her head. Oh I can't wait for the contest!!! patsee: I noticed that too! *sigh* what people will do for fame! cicada shells are NOT GROSS. I think that Shokotan is already very famous (maybe she just wants more attention.) You should read her Wikipedia article, she does alot of stuff. Princesslilo from princesslilo.wordpress.com: I THOUGHT OF THAT BEFORE SHOKOTAN DID!!!! now I can't start my trend when I start singing......I hope I can still do it and not be thought of as following a trend...I'm a trend setter, not a follower.